AXOR One Thermostatic Shower Module for Concealed InstallationFrom £451.75 inc.VATRRP: £695.00 (Save 35%)Choose from: 1, 2 or 3 outlets. 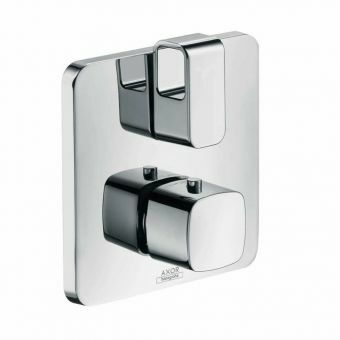 Supplied in chrome as standard, special finishes available on request. Hansgrohe ShowerSelect Thermostatic MixerFrom £286.01 inc.VATRRP: £440.00 (Save 35%)Thermostatic mixer valve from the ShowerSelect range, controls temperature only, requires additional valves. Free DeliveryCrosswater KH Zero 2 Thermostatic Shower ValveFrom £251.30 inc.VATRRP: £359.00 (Save 30%)Discreet diverter controls send the water where you want. Hansgrohe ShowerSelect Thermostatic Mixer, with on/offFrom £390.00 inc.VATRRP: £600.00 (Save 35%)Thermostatic control, with a push button for on/off control. 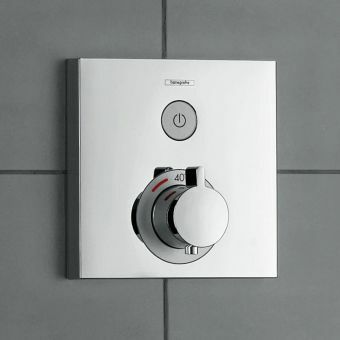 For 1 outlet or as main ShowerSelect on/off unit. 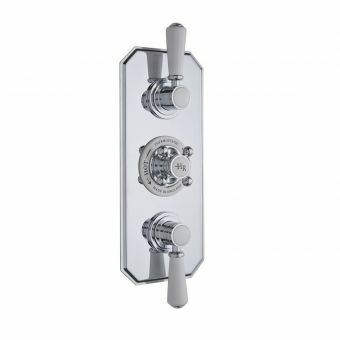 We have a wide variety of styles of shower valves at our web page, over 200 in fact and these range from high end thermostatically controlled mixers many of which can be operated by remote control.Temperature setting can be set for different users and anti scald devices are standard on most of the thermostatically operated mixers. 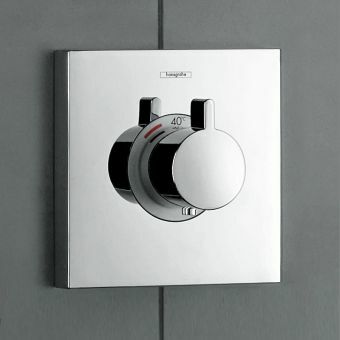 The mixers range from fully concealed, to exposed which enable these to be fitted to an existing cubicle or wetroom. 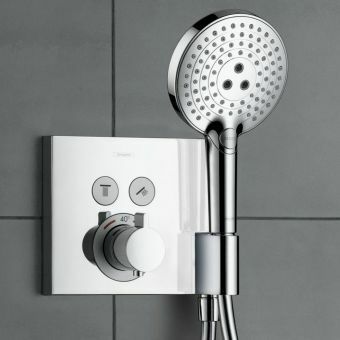 Naturally not all the shower valves are thermostatically controlled we have a huge selection of manual mixer valves and the modern manual mixer is very accurate and with today’s ceramic technology, the preferred temperature to suit all users is simply and easily made. Overbath showers are now part of most homes modern bathroom and perhaps you may feel that it is time to upgrade the present one with a new shower bath diverter. 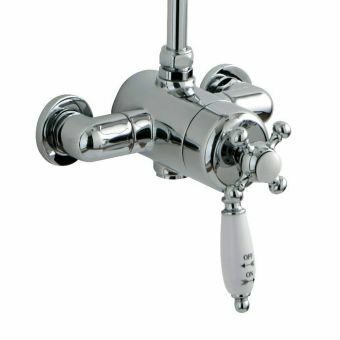 We have a wide choice of birth modern and traditional diverter shower valves and these can be either exposed of fully concealed. 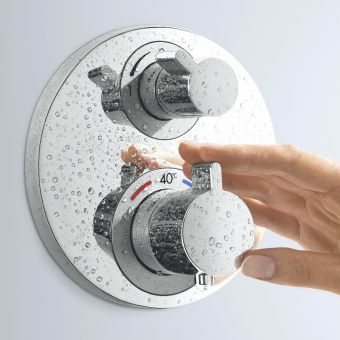 If you are unsure which shower valve is best suited for your requirement, we are always happy to discuss the options; it may be that you have a high or low water pressure, a combi boiler for example. We are sure to be able, from our wide selection, suggest the best shower valves for you. 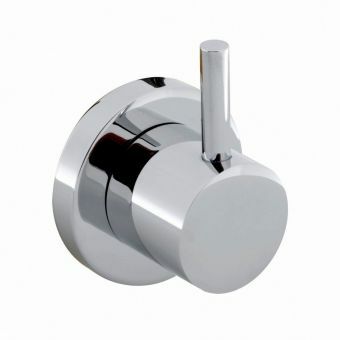 When you're looking for shower valves, you can be assured of the widest choice here at UK Bathrooms. 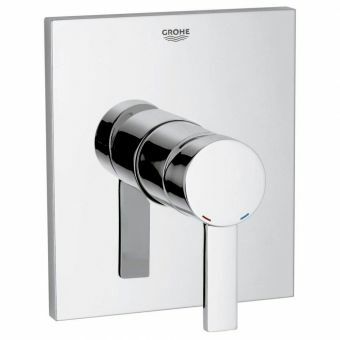 With a huge selection of high-quality shower valves from major brands, such as Hansgrohe, Burlington, Crosswater and Grohe, you're guaranteed to find the perfect choice for your bathroom. Whether you're looking for classic, contemporary or innovative design, there's something for everyone, with more than 200 products available for the discerning customer. The different types of unit available are exposed, concealed, manual, thermostatic or digital, in traditional and contemporary styles. Whether you have a particular manufacturer in mind, or a specific style, read on before you make your choice to learn about some of the available options. First, let's take a look at some of the various designs on offer. Concealed shower valves are exactly what their name implies: they are concealed behind the tiling in your shower. The only part that's visible is the control plate and handles, with the remainder hidden out of sight. 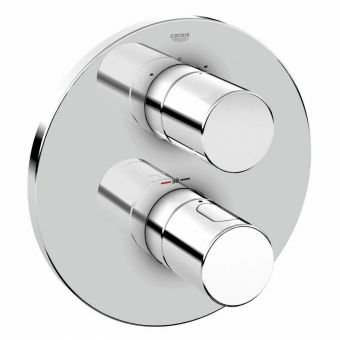 Concealed shower valves can create a more aesthetically-pleasing appearance, masking any fittings and pipework. 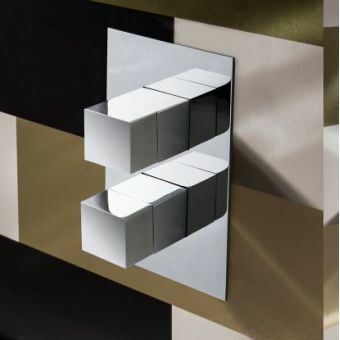 This style also offers a flexibility of design options, such as shaped wall plates and different handles. If you opt for an exposed shower valve, normally it's a horizontal bar that protrudes outside of the wall. 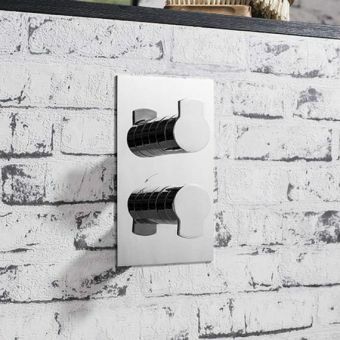 This design can be fitted more quickly and easily, since only the hot and cold water pipe feeds need installing within the wall, rather than the whole valve. One difference between the two types is that you can place concealed valves on a different wall from the outlet that they're controlling. For example, the valve could be installed at the shower's entrance on one wall, with the shower slide rail and fixed head on the opposite side. An exposed shower valve has less flexibility due to the limitations of the length of the shower hose. It comes down to personal choice at the end of the day, and possibly cost, as exposed valves can be cheaper to install, whereas concealed valves can produce a neater look. 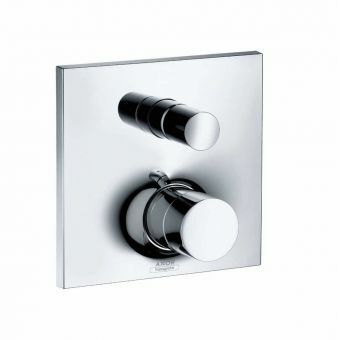 One of our most popular choices is the Hansgrohe Ecostat Concealed shower valve. With its modern appearance and intuitive controls, it's easy to see why consumers love it so much. 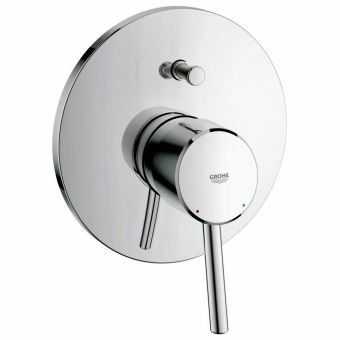 All the plumbing components are hidden behind the chrome mounting escutcheon, creating a minimalist, neat appearance. 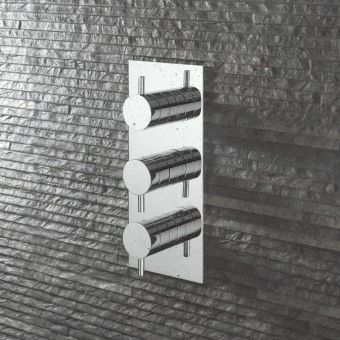 With a convenient wipe-clean approach, this model is ideal for a modern shower enclosure, its simple, cylindrical pieces matching the bold minimalism of its mounting plate to create a sleek appearance. 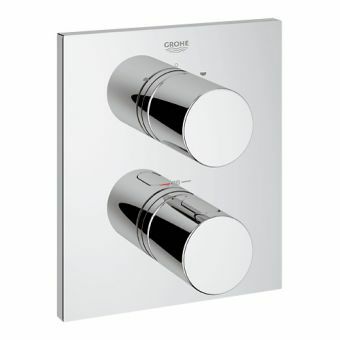 The Allure Exposed Thermostatic shower mixer, manufactured by Grohe, is another popular choice. 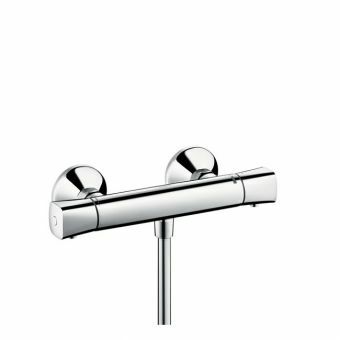 The wall-mounted, thermostatic shower mixer protects you against any changes in temperature by combining the hot and cold water, preventing scalding. It's available in a classy chrome finish. 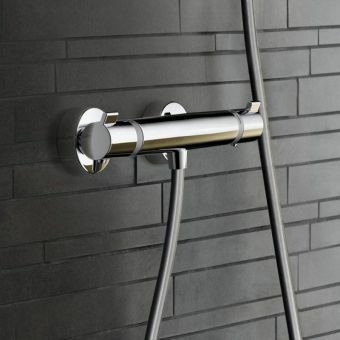 Extremely strong and durable, the thermostatic shower mixer features CoolTouch ceramic safety housing. A manual mixer shower is perhaps the type that most people best understand. It takes its water from the existing hot and cold supply, combining them within the unit. 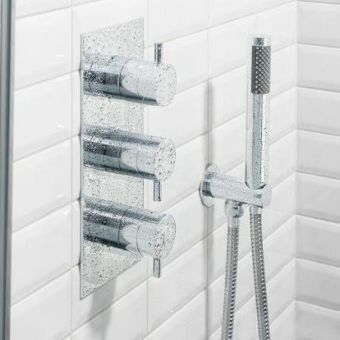 They are a popular choice for shower baths when purchased with a diverter option, enabling you to turn on the taps, flick the diverter switch and allow the water to flow into the shower head instead. 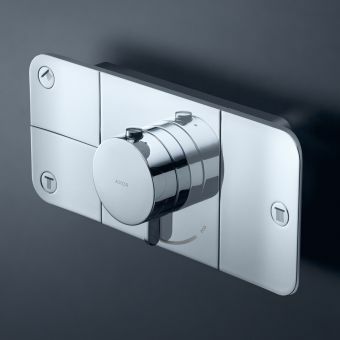 A popular choice of concealed manual shower valve is the Grohe Allure Brilliant, providing either a single outlet for the shower only, or a two-outlet option (Diverter) for running a shower and filling the bath. With its precise edges, it has a unique appearance, with its diverse surfaces reflecting light, creating the finish of a perfect gem! 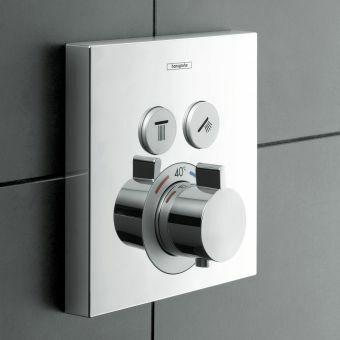 Thermostatic showers give the user total control over the temperature. They take water from your existing supply, but unlike the manual unit, the thermostatic incorporates a pre-set thermostat. This will keep the water temperature consistent, including if a tap is turned on elsewhere in the property. 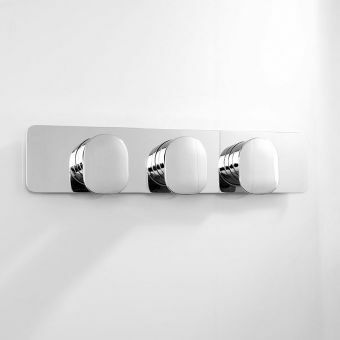 They can be deck-mounted to use in a shower bath, or will work with a concealed or exposed unit. Which is ideal if there is a risk of children or elderly people accidentally scolding themselves using a manual mixer. Our Crosswater Kai thermostatic shower valve is available in high pressure or medium options, providing easy, intuitive control over your shower. With separate temperature and flow controls placed at either end of the main unit, the Crosswater Kai has a smooth appearance, with thermostatic features integrated for convenience, comfort and safety. 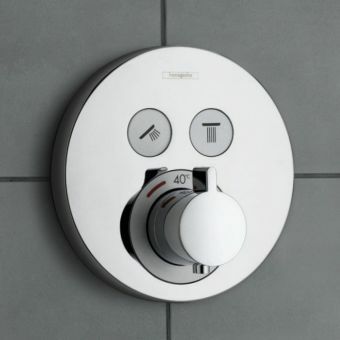 A digital shower is something of revolution in shower technology, allowing you much more control over the temperature. A digital shower enables the user to set the correct temperature using the wireless digital shower panel that's installed in the shower. Thanks to digital showers being programmable, they can be set to "warm up" mode, gently heating the water to your chosen temperature before you step in. This means you can avoid being sprayed by freezing water jets! The wireless digital panel gives you complete control over both temperature and water flow, so you can programme it to suit your personal preferences. A digital shower is the more modern choice, bringing luxury to your home. It's an ideal solution for houses that don't currently have shower facilities, as you can install the pipework and pump in the loft, above the bathroom. This avoids the need to run plumbing and electricity through the house to the bathroom, as the shower head can come through the ceiling. The two main trends in bathroom design are traditional and contemporary. Before making your choice, take into account the general décor of your home, as normally it's preferable for the bathroom to complement this. The bathroom suite will define its ambience, with aspects such as the lighting and colouring complementing the style and features. Traditional bathrooms exude a classic, comfortable appearance, yet with the benefit of modern mechanisms. They tend to have more rounded features and softer edges, with design elements such as cross-head taps and traditional-style materials. Contemporary bathroom suites can be more "edgy" and modern in appearance, using design innovations to break with convention. They come in a myriad of shapes and colours, with more modern designs, such as corner baths and shower baths, making a real style statement. 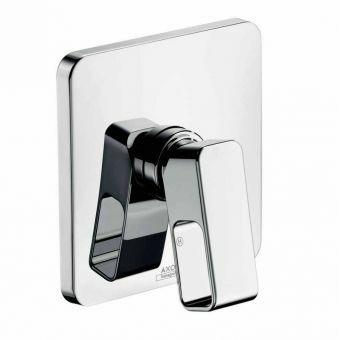 Here at UK Bathrooms, we stock a wide range of shower valves to complement both traditional and contemporary bathrooms, with a bathroom suite to suit every preference. 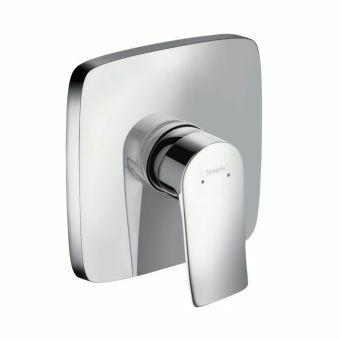 Among our contemporary options is the Crosswater KH Zero 3 thermostatic shower valve, featuring a bold, sharp design by renowned South African interior designer Kelly Hoppen. The KH Zero 3 embodies her flair for modern design, combining an unusual and bold aesthetic appearance with a functionality that's suitable for the modern bathroom. 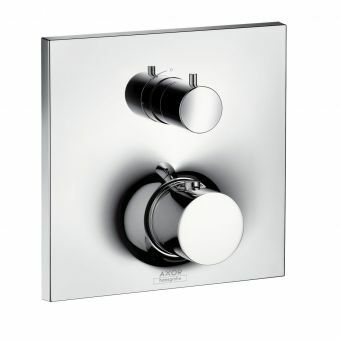 If you're looking for a more traditional design, the Talis Classic manual concealed shower valve, by Hansgrohe, effortlessly combines traditional styling with a modern feel. Its brushed-nickel finish offers a note of nostalgia to the fixture styles, providing classic beauty for your bathroom with traditional styling elements. 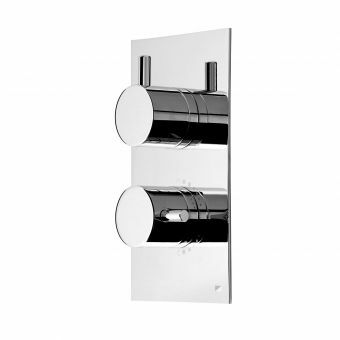 It's down to personal choice whether you wish to have a shower with or without diverters. 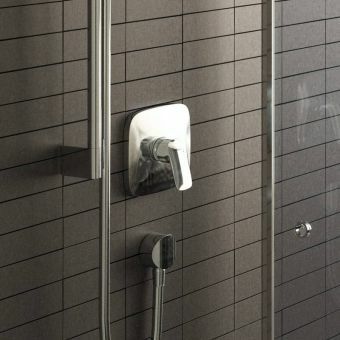 One benefit of having a shower with diverters is that this allows you to have multiple attachments, or outlets. Having diverters enables you to install your shower over the bath, so you won't need a separate shower stall. This can save space in the bathroom in terms of extra piping and tiling and consequently can save you money on installation costs. 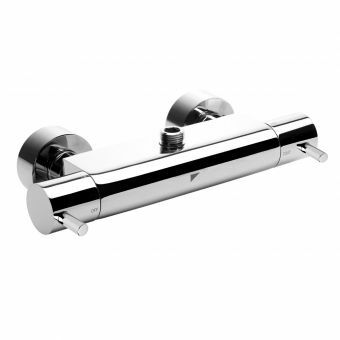 We stock a wide range of showers, both with and without diverters. 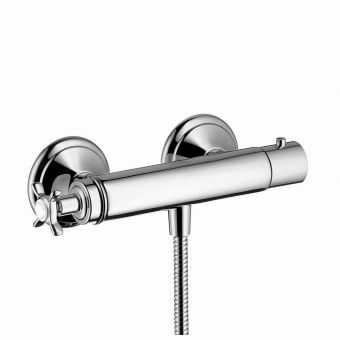 Among our popular options is the Burlington Trent, a concealed shower kit that comes with a diverter valve. The shower's two outlets are selected by using the integrated diverter valve. This alternates between the overhead unit and the separate shower. It offers options for two or three controls and a choice of various handles to give our customers multiple options. 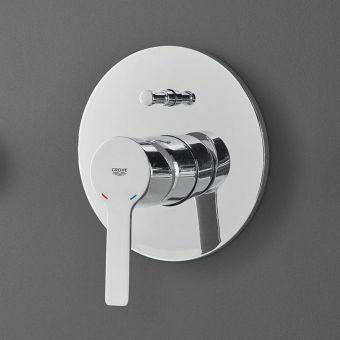 Here at UK Bathrooms, we're proud to offer more than 200 styles of shower valves, ranging from top-of-the-range, thermostatically-controlled mixers, some with remote control, to traditional manual options. We always have customers' enjoyment and safety at the forefront and many of our shower valves feature anti-scald devices as standard. For further information on any of our products, or to discuss options for your bathroom requirements, please don't hesitate to contact our friendly and knowledgeable customer advisors, who can help and advise before you make your choice. Shower Valve Water Pressure: What is water pressure and why is it important? It can mean the difference between having a working bathroom and not. Different valves and manufacturers will have shower valves designed for either low water pressure or high water pressure, and it will generally depend on what it’s being used for. Generally speaking, the more outlets the valve has the higher the water pressure you will need. Your water pressure is determined by the water system you have in place. Low water pressure is a result of have a traditional water system such as gravity feed system. This was the standard in the UK for many years; if you have a period house then it’s more than likely you have a gravity system. The rest of Europe is light years ahead of us in terms of water pressure. This is a problem unique to us compared to the rest of Europe. 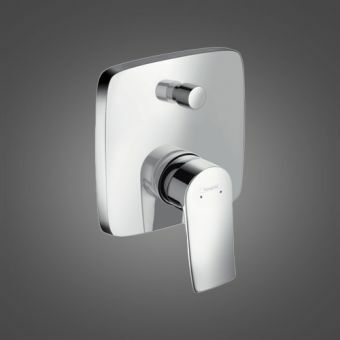 The main problem with that is that the leading names in Shower Valves are people like Hansgrohe and Grohe; German manufacturers that do not understand why are plumbing is so out of date. 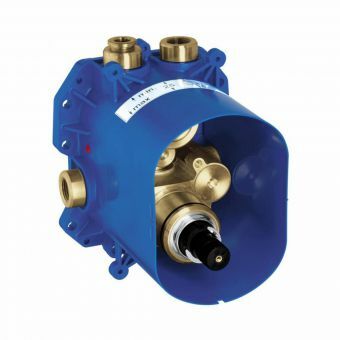 Fortunately, boilers and water systems such as combi-boilers produce vastly improved pressure and you will have no problem with higher pressure valves. All is not lost for those with low pressure! You don’t need to rush out and spend an arm and a leg on the latest all singing all dancing boiler that will set you back thousands. There are plenty of high quality British manufacturers who are familiar with our plumbing and cater for this market. 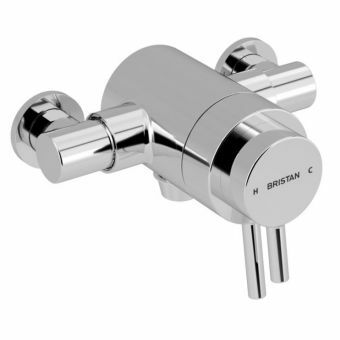 For low pressure valves please see Bristan, Pegler & Crosswater. What are the boundaries for water pressure? Is there a way I can increase my water pressure? Yes. As discussed previously you can look at changing your water system. Alternatively, you could look at a shower pump. It’s always advisable to discuss this with your plumber who can measure you pressure and let you know which system you have. You can then look at what options are available to you.